The Seattle City Council is holding a public hearing on Seattle’s Comprehensive Plan, Seattle 2035, on Monday June 27th at 6 pm. Arrive by 5:30 pm to sign in to comment for up to two minutes. The hearing will be held in the Seattle City Council Chambers at City Hall: 600 4th Ave, Second Floor. This sample message can also be a starting for your personal comments, or modified into a letter. This hearing is your chance to be heard about the proposed zoning changes in Crown Hill Urban Village. The Seattle Comprehensive Plan includes amendments that would expand the boundary of Crown Hill Urban Village, and allow upzoning of single family properties to multifamily within the Urban Village and expansion area. Our neighborhood is slated for the largest upzone and expansion into single family properties in the City. Are not based on neighborhood planning or analysis that would inform or direct smart growth for our community. Do not have requirements for concurrent investments in transit or other basic infrastructure such as parks, schools, sidewalks or utilities to accommodate the future demand or make our community more livable. Expand the urban village boundaries and rezone single family homes to multifamily even though we have enormous unused development capacity along our arterials (15th Ave, Holman Rd and 85th St) that are underutilized and would benefit from re-development. Put small, locally owned businesses at risk and miss opportunities to bring in new small businesses that will create a more desirable urban center. Let’s ask the City Council to make growth in our neighborhood positive for our community, both current residents and the new neighbors we will welcome. Please join us at the Public Hearing Monday, June 27th. We know it can be intimidating to speak in public. But it’s an effective way to shape policy and get the attention of the policy makers. Tips for commenting are here. Email info@crownhillurbanvillage.org if you would like help writing your comments. 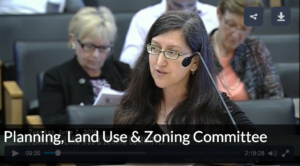 Watch commenting in action as our neighbor Ann speaks up for Crown Hill Urban Village. (skip ahead to minute 7). If you can’t join us at the hearing, you can submit written comments by 5:00pm on June 27th to Councilmember Rob Johnson. Submit by email to amy.gore@seattle.gov. Or mail to Councilmember Rob Johnson, Seattle City Council, 600 4th Ave, 2nd Floor, Seattle, WA 98124. (206) 684-8808. Please copy Councilmember Mike O’Brien, our representative and key member of the Planning, Land Use and Zoning Committee. Our actions are making a difference. Let’s keep asking for the common-sense policies that will make Seattle’s growth a win/win for all of us. And please forward our website crownhillurbanvillage.org to your neighbors and urge them to subscribe and get involved. ← How do you imagine Crown Hill Urban Village in twenty years?